This pulled chicken recipe is smothered in an adobo- and chipotle-spiked barbecue sauce and served with a refreshing cilantro slaw to add creaminess and texture. Canned chipotle peppers in adobo sauce can be found in many grocery stores and ethnic markets, but if your store doesn’t carry them, you can add spice to the sauce with cayenne or chipotle powder, or leave it out and enjoy simple, delicious barbecue chicken. Want to add more kick? Mix a little finely chopped jalapeño to the slaw. 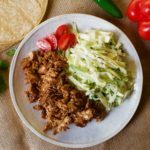 Enjoy this pulled chicken and slaw combo as it is, use it to stuff corn tortillas, or make an open-faced sandwich or sliders. This pulled chicken recipe is smothered in a rich adobo and chipotle-spiked barbecue sauce, and served with a refreshing coleslaw. Try it in tacos. Combine ¼ cup vinegar, mayonnaise, cilantro, honey, and celery seed in a large bowl; mix well. Add cabbage; mix well. Cover and refrigerate for 20 minutes. Add onion; cook for 4 to 6 minutes, or until onion is translucent. Add garlic; cook for 1 minute. Add chipotle pepper, adobo sauce, barbecue sauce, and remaining ¼ cup vinegar; cook, stirring occasionally, for 6 to 8 minutes, or until sauce thickens slightly. Add chicken, cook, stirring frequently, for 4 to 5 minutes, or until chicken is well coated and heated through. Add a side salad or more veggies to make a great dinner option.